As a young boy, he carried a pencil and pad of paper along with him on his adventures. He hiked on top of the mountains of Marin County and took a break to sketch the trees along the coast. Without formal training, Jon Rattenbury is a self-taught artist who learned to draw and paint by practice. He looks to his family and childhood experiences for inspiration as well as to the world around him. “I am always amazed at the variety of wonderful visions nature creates and I feel a need to capture that feeling on canvas,” he says. At 13 years old, Rattenbury began experimenting with the use of color and light. He started painting with oils but soon discovered that he really enjoyed painting with acrylics the most. He says over the years he has found ways to create interesting effects using the glazing medium and various other media to help control what the paint does. Rattenbury’s work has been displayed and sold at shows and galleries across the U.S., and continues to grow in popularity in Japan. 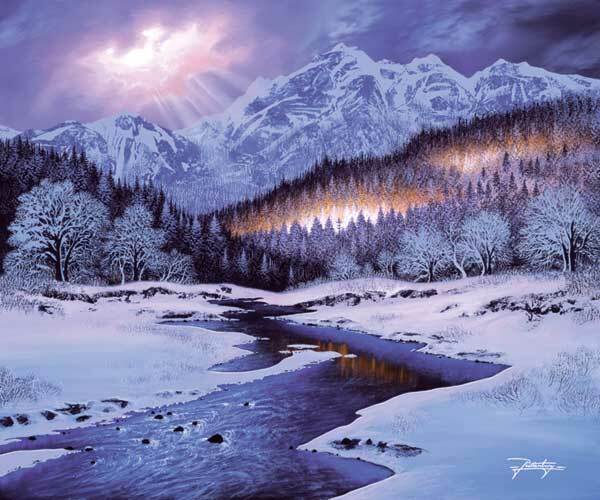 His art has also been used for many different products including jigsaw puzzles, cross stitch patterns, wall murals, mosaic tile and digital files for screen savers, calendars, cards and more. “I feel lucky that I am able to do what I love for a living,” he says. Rattenbury was born in England, grew up in the Bay Area and now lives in El Dorado Hills with his wife Jeanni and children, Zackary and Bailey. He is currently working on a 200-page coffee table book with over 300 full-color images of his work, which will be available for purchase at his Web site. For more information on Rattenbury’s work, visit rattenburyart.com.